“We are excited to get started; giving realisation”. | Realise the World! Today, 40 yogis from around Australia, New Zealand, UK, Ukraine and Italy set of from Our Mother’s House in Burwood (Sydney) in a luxury bus, for the CoolCheck tour of Eastern Australia. The trip, in our deluxe, air-conditioned vehicle, was smooth and relaxed, punctuated with spontaneous bhajan sessions and Disney films. 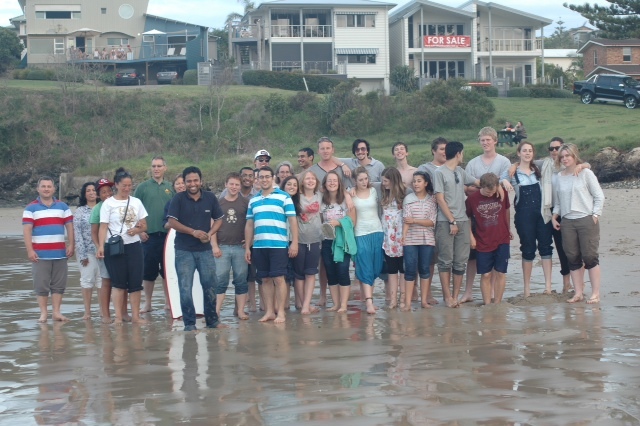 The journey to Woolgoolga (600kms north of Sydney) ended with a collective footsoak and swim at safety beach, followed by a delicious feast of dal and rice, honey soy chicken, salad, turkey bolognese, banana, chocolate and carrot cake. This wonderful spread and warm hospitality was provided by the local yogis; Anita, Sarah, Peter and little Kubera. Enjoy the bliss and cool breeze !! !